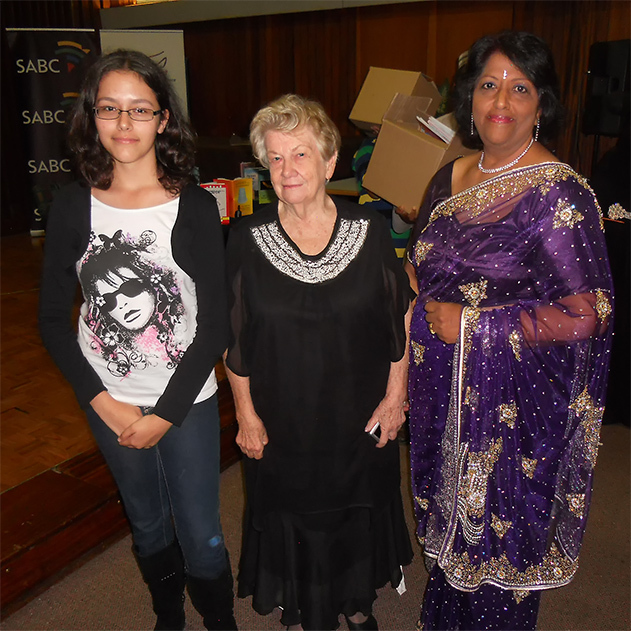 Joseanne Capelo (left) is photographed at the Dancing Pencils Annual book launch with Veena Gangaram (right) who was her Mentor at the BAT Junior Dancing Pencils Writing Club where Joseanne completed and launched her first 220 page novel called “Sunshine in Dark Times.” Centre is Felicity Keats who is the Mentor of the Blue Moon Dancing Pencils Writing Club that is housed in the SABC Head Offices in Durban and meets on a Sunday afternoon each week. Felicity has completed one six-month course of novel writing at the Blue Moon Club. 14 new novels will be the result, 12 in isiZulu and 2 in English. She has started a new novel writing course which Joseanne now attends. Joseanne is writing her third novel. We celebrate the talent that is in all of us and congratulate those who have the determination to see positive results in the form of published books from their passion for writing. The story highlights changes in a child's life from having the opportunity to learn to write stories and to read. The child starts out as an orphan in a squatter camp, and finishes up as a bright little girl with her own book launch and published story. It aims at getting funding in our NPO to enable the NPO to help with literacy by training children to write stories, publishing them and then giving books to disadvantaged children and so encouraging reading of child written books. This helps with literacy as children will read what children write.. The little orphan is the daughter of Bonga Zondo, who was the cameraman and editor. The teacher is Bonga's wife. The script was written by Felicity Keats who is also a right brain trainer and a niche publisher. the voice is Detlev Diegel, also a colleague. Grade 3 Learners in five districts in the Free State, South Africa write books in five different home languages. Free State Grade 3's as authors! © 2019 Dancing Pencils. All rights reserved.